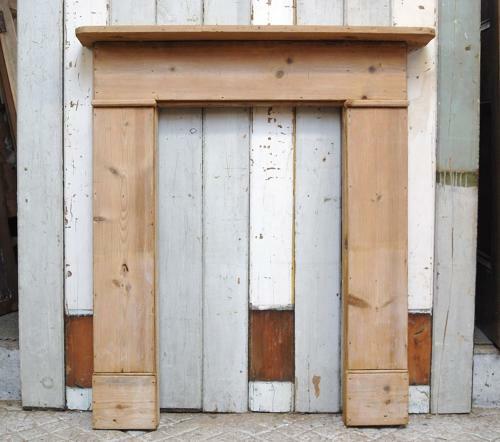 A simple pine fire surround made using old reclaimed pine. The surround has a classic design with plain mantel, moulded detailing at the top of the legs and chunky feet. The wood has been stripped, has an attractive colour and grain, and is ready for a paint, wax or oil finish . The surround is ideal for framing a cast iron insert and is of a compact size, perfect for a bedroom or smaller reception room. The surround has been made using reclaimed wood and therefore has some wear and rustic features. The surround has some filled wood knots, marks and scratches. There is a thin crack to the mantel edge and some further small splits. The fire has some visible nail holes. There are some knocks and wear, especially to the leg bases. The simple design of the fire surround makes it ideal for a period or modern property and would fit nicely with many insert designs.